The scenic seaside village Kolimpari, situated in a distance of 24 km on the west of Chania, is offering you a number of chances to feel in your skin the Greek dream and explore the magic of Crete, one of the most exciting islands of the country. 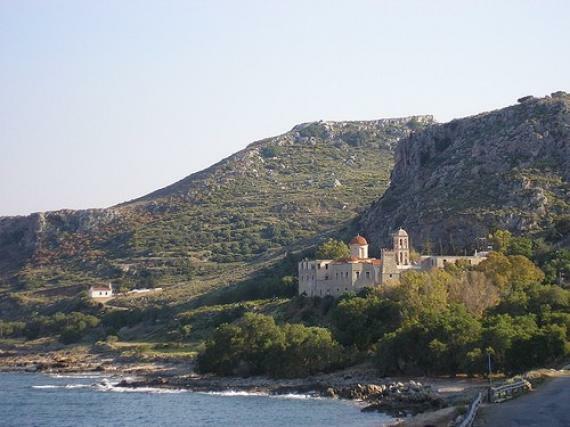 Due to its protected port Kolimpari has been gathering a number of visitors from all around the world as it is close enough to Chania as well. With a number of hotels and accommodations that cater for your every need Kolimpari is a big village at the foot of the Rodopou peninsula and is rumored to be one of the most quiet villages of the area. This village is the antidote to a busy winter, so if what you are looking for is to relax and unwind away from everyone with your family or your other half then this tranquil village that lies between the sea and the cliffs will give you at once all that you need. Kolimpari has an amazing endless beach that will make you fall in love with the place. If you do not care about the island’s vibrant nightlife and you wish to really spend quality time with your other half or family then this place will offer you great food at the various restaurants and taverns, the most unforgettable seas and of course the chance to come as close as you possibly can with the real you. Live your life during your holidays trough the eyes of the locals that are more than friendly and you will see how this will make you feel amazing, on the inside and the outside! Forget your desk, your PC, even your house and unwind in an amazing scenery in the heart of Crete. If you wish to see as much as you possibly can from the area there are many places to visit like the village Nohia, 7 kilometers at the south and admire for your own tradition in pottery. The cave of Agios Ioannis Erimitis, 3 kilometers far from Kolimpari at the south, near the village Marathokefala, is also a place that is worth visiting. Find information about selected Hotels, apartments and rooms in Kolimpari to choose the perfect place for your accommodation.